The greatest and most exciting sporting event of the season is set to kick off on Thursday, and people can’t get enough of filling out brackets. Instead of trying to win NCAA Tournament pools, placing a bet on who will cut down the nets is a better option. Here is a look at the current odds to win the NCAA Tournament with a pick thrown in as well. Duke has the best odds by a large margin, and they should. The Blue Devils were impressive in winning the ACC Tournament title, and they have just one loss when fully healthy this season. Zion Williamson has proven himself as the best player in the country, and RJ Barrett and Cam Reddish are NBA Lottery picks. The Blue Devils are loaded. Everyone remembers Virginia being the first number 1 seed to lose to a 16 seed a season ago, but the Cavaliers are back. Virginia is once again the top defensive team in the country, but they can score better on the offensive end. The Cavaliers won’t let history repeat itself this season. Gonzaga is the only team to beat Duke this season when the Blue Devils were fully healthy, and the Bulldogs have a ton of elite talent. The Bulldogs once again coasted through the West Coast Conference but stumbled in the tournament game in a loss to Saint Mary’s. Everyone seems to agree that this is head coach Mark Few’s best Gonzaga team. North Carolina shared for the ACC regular-season crown with Virginia, and the Tar Heels beat Duke twice this season. The Tar Heels almost beat their rival a third time, but Zion Williamson took over. North Carolina plays extremely fast, and they can score in a hurry. The Tar Heels won’t be an easy team to beat. Tyler Herro and PJ Washington lead an extremely talented Kentucky team. The return of Reid Travis gives the Wildcats some veteran leadership, and Kentucky has the depth to play with anyone. John Calipari has his team defending at an elite level, and that will carry them. The Spartans are always a contender in March, and they enter the tournament with a ton of momentum. Michigan State is led by point guard Cassius Winston, but they have some studs in the paint as well. Bet against Tom Izzo if you want to, but Michigan State has a real chance to win this thing. Tennessee is one of the most experienced teams in the country this season, and they can really score the ball. Admiral Schofield and Grant Williams get all the hype, but the Volunteers are deep. If Tennessee gets to the Elite Eight, a matchup with Virginia should be looming. Michigan was a Final Four team a season ago, and John Beilein has his team back in contention this season. The Wolverines are just behind Virginia in terms of best defense in the country, but Michigan struggles to score at times. If Michigan makes shots, they can beat anyone. Texas Tech had a terrific Big 12 Conference season, but they aren’t a real title contender. Forward Jarrett Culver is a future NBA star, but he is all the offense for the Red Raiders. Auburn set a new SEC record this season for three-point field goals per game, and they shoot at a ton of them. The Tigers made them all weekend long in the SEC Tournament, but they are a bad shooting night away from getting bounced early. The most intriguing team from this group is the Florida State Seminoles. Florida State upset Virginia in the ACC Semifinals and battled Duke in the title game. Head coach Leonard Hamilton has a deep and athletic team that could bust some brackets this year. This is a very interesting group of teams, and all three of them seem to have Final Four potential. Houston dominated the American Athletic Conference this season, and the Cougars can really score. Iowa State might be the best shooting team in the tournament, but they have some head-scratching losses. LSU will be without their head coach, Will Wade, but the Tigers have freakish athleticism. One of these teams might get hot and make a deep run, but they could also lose in the first weekend. There are certainly some teams in this group that are worth looking at, but realistically they don’t have a chance to win the whole thing. There might be a Final 4 team from this group, but that’s about it. The two best teams in the country this season are the Duke Blue Devils and North Carolina Tar Heels. UNC was able to beat Duke twice this season, but Duke won the most recent game. I think that they will meet up in the NCAA Championship Game, and Duke will even the score by beating North Carolina for a second time. Bet the Duke Blue Devils +225 to win the NCAA Men’s Basketball Championship. The 2018-19 men’s college basketball season is reaching the final few weeks, and conference races are starting to get extremely heated. There aren’t a ton of top-25 matchups on the schedule this weekend, but there are several great games. Let’s take a look at the four best games on the weekend slate and make a betting pick and prediction for each game. 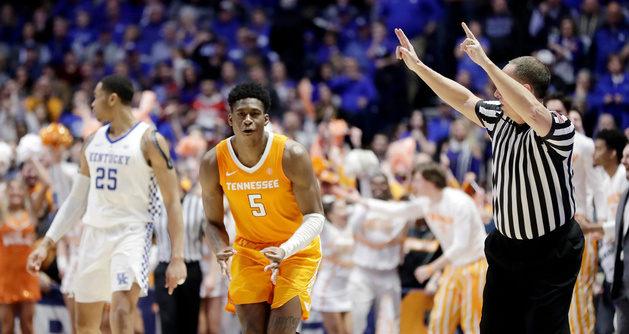 The best game of the weekend will take place in the SEC when the Tennessee Volunteers host the Kentucky Wildcats in a top-10 clash. Tennessee will no doubt be looking for some revenge after getting blown out by Kentucky just two weeks ago. The Volunteers are a very experienced team that is averaging 83.6 points per game. 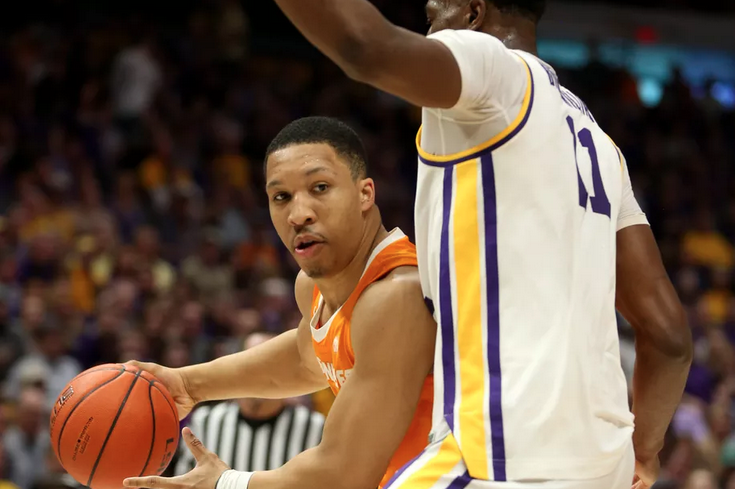 Forward Grant Williams leads the team with 19.0 points and 7.6 rebounds per game this season, but Tennessee also has a terrific group of players in the backcourt. The Volunteers managed to score just 69 points in their first meeting with Kentucky and must shoot the ball better in this rematch. Kentucky is getting the job done with their defense this season, allowing just 64.9 points per game. Forward P.J. Washington has emerged as a real threat in the low post, averaging 15.2 points and 7.9 rebounds per game. These two teams should meet up again in the SEC Championship Game, but the Volunteers are winning this game. Bet the Tennessee Volunteers over the Kentucky Wildcats. Gonzaga is back to being the top-ranked team in the country, but they have a difficult game on Saturday night against the Saint Mary’s Gaels. Saint Mary’s has always played Gonzaga tough through the years, and they might be the only team capable of giving Gonzaga a loss in the West Coast Conference. Gonzaga beat the Saint Mary’s by 48 points earlier this season, but this game will be much closer this time around. The Gaels are one of the better defensive teams in the country, allowing just 65.4 points per game this season, but Gonzaga is even better allowing just 65.2 points per game. Gonzaga is much better on offense, scoring better than 90 points per game and they have an extremely deep and talented roster. The Gaels will need guard Jordan Ford (21.8 ppg) to go off in this game if they are going to have any chance. Don’t expect this game to be another blowout, but Gonzaga is going to win again. Bet the Gonzaga Bulldogs over the Saint Mary’s Gaels. One of the most underrated games on the weekend schedule is a Mountain West Conference clash between Utah State and Nevada. Nevada is trying to lock up the regular season Mountain West Conference title, but Utah State can move into a first-place tie with a win. Utah State is led by guard Sam Merrill who is averaging 20.2 points and 4.3 assists per game. The Aggies have also been great on defense this year, allowing just under 66 points per night. The Wolf Pack are led by a trio of future NBA stars in Caleb and Cody Martin and Jordan Caroline. That trio has combined to score more than 48 points and grab 20 rebounds per game. Nevada plays an aggressive defense that is holding opponents to 65.9 points per game this season. The Wolf Pack beat the Aggies by 23 points earlier this season, but this matchup is going to be much closer. Nevada should have enough talent to come away with the win, but expect a close, low-scoring game. Bet the Nevada Wolf Pack over the Utah State Aggies. The Maryland Terrapins will host the Michigan Wolverines in a battle of top-four teams in the Big Ten Conference. Michigan beat Maryland by 13 points earlier this month, but Maryland has been tough to beat at home. Both teams are in the top 30 in team defense, but Michigan is the third best defensive team in the country, allowing just 58.4 points per game. Anthony Cowan Jr. leads the team with 16.0 points per game this season, but center Bruno Fernando has been the real star. Fernando has poured in 14.4 points per game while also averaging 10.6 rebounds per contest. The Wolverines also have a star big man in Iggy Brazdeikis, but Michigan is led by a trio of talented guards. Point guard Xavier Simpson is the catalyst of the offense, leading the team with six assists per night. Don’t expect many points in this game, but Michigan will find just enough scoring to pull off the upset on the road. Bet the Michigan Wolverines over the Maryland Terrapins. The 2018-19 NCAA Basketball season is in the second half of the regular season, and conference races are heating up throughout the country. With the March Madness Tournament being one of the most watched and bet on sporting event in the country, it’s time to take a look at the updated betting odds to win the 2019 NCAA Basketball Championship. 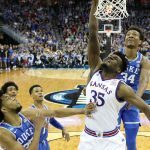 Duke Blue Devils +175: It should be no surprise to anyone that the Duke Blue Devils are heavy favorites to win the 2019 NCAA Basketball Championship. The Duke team is absolutely loaded with future NBA stars, and they have already beaten some of the top teams in the country this season. 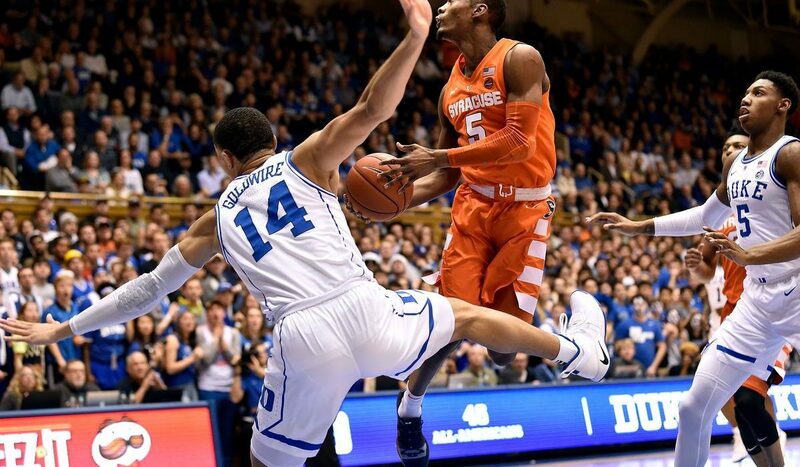 The Blue Devils have lost a pair of games this season, but they will be hard to beat in March. 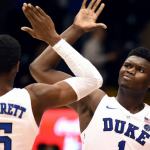 With RJ Barrett and Zion Williamson leading the way, look for Duke to make a deep run in the NCAA Tournament. Michigan +800: The Michigan Wolverines made it to the National title game a season ago, and they might be even better this season. Head coach John Beilein’s teams are traditionally known for their offense, but this version of Michigan can defend at a high level as well. The Wolverines have a proven leader in point guard Xavier Simpson, and they will be battle tested from playing in the rugged Big Ten. Virginia +850: Virginia has just one loss on the season, a close loss to the Duke Blue Devils. The Cavaliers are the top defensive team in the country, and they are one of the most experienced teams in college basketball. Of course, they were also the first number 1 seed to lose to a 16 seed a season ago, but don’t be scared off by that this time around. Virginia is for real. Tennessee +900: The Tennessee Volunteers are the top-ranked team in college basketball at the moment, yet no one seems to be talking about them. Tennessee is scoring better than 86 points per game, and they can score points in a hurry. They have been largely overlooked for much of the season, but they will make noise in March. 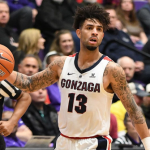 Gonzaga +950: Head coach Mark Few has had some great teams during his Gonzaga tenure, but this version might be the best. The Bulldogs have dealt with some injuries already this season, but when fully healthy have the talent to win a National title. Gonzaga is no longer a Cinderella team, but they will likely captivate the country in March. Kansas +1300: The odds for the Kansas Jayhawks have taken a big hit since the injury of Udoka Azubuike. Kansas suddenly looks extremely vulnerable, but head coach Bill Self will get things turned around in Lawrence. The Jayhawks still have a ton of talent on their roster, and Kansas knows how to win in March. Don’t count the Kansas Jayhawks out of it just yet. Michigan State +1400: Personally, seeing Michigan State this far down on the list just seems crazy to me. The Spartans have rolled through their first eight games in Big Ten play, and Tom Izzo has his team playing well on both ends of the floor. It has been a few seasons since the Spartans were able to reach the Final Four, but this team feels like the team to end that skid. Cassius Winston might be the best point guard in the country, and he has plenty of weapons around him. Nevada +1800: Nevada has been hyped up since their Sweet 16 run a season ago. The Wolf Pack have three legitimate NBA prospects in Caleb and Cody Martin and Jordan Caroline, and they can score with any team in the country. The problem for Nevada is that they won’t be tested in conference play, and that could come back to bite them in the NCAA Tournament. There is no denying that Nevada has the talent to make a run. Kentucky +2000: The young freshman stars for Kentucky are improving with each game, and the Wildcats are playing terrific basketball. Kentucky just went on the road and upset Auburn, and they should battle Tennessee for the top spot in the SEC. Kentucky still needs some work on the defensive end, but John Calipari has himself another loaded team. North Carolina +2200: The North Carolina Tar Heels have been hard to figure out this season. Some nights they look like the best team in the country, but then they seem to take other nights off. If the Tar Heels are able to find some consistency, then look out for Roy Williams and company in March. Are We All Set For Drama In This Week’s Big Champions League Quarterfinal 2nd Leg Ties? Who Wins The Champions and Europa League Quarterfinals?